I missed seeing the St. Patrick's Day parade when I visited Chicago last year, due to a weather-induced flight delay. I caught it this time, in St. Louis, when I was in the city for a business trip. St. Patrick, one of the patron saints of Ireland, was a kidnapped slave who later became a missionary (and a bishop). The day of his death, March 17, was marked as a feast day and is celebrated in Ireland and in places with substantial Irish communities. The parade in Market Street. 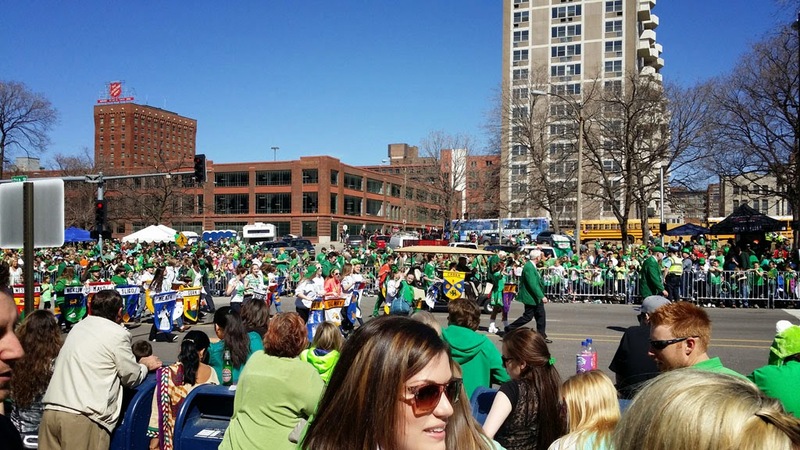 St. Louis is one of such places in the United States, and every year, a St. Patrick's Day parade is held to celebrate the patron saint. 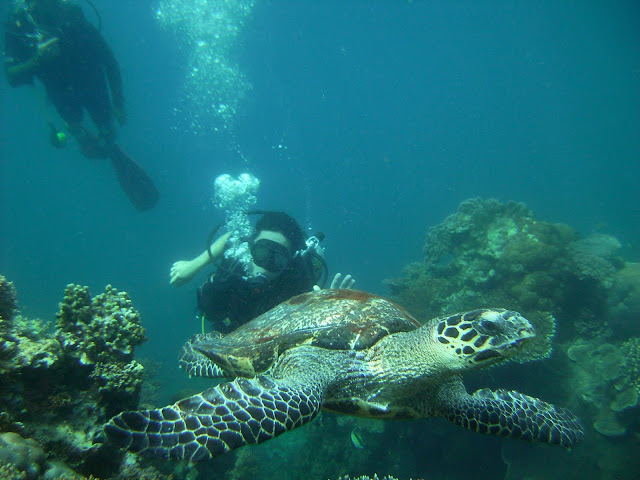 The day itself also became a celebration of the Irish cultural heritage, with symbols such as the shamrock and the color green figure prominently in the event. They even dye the river in Chicago green as part of the festivity, and there's a tradition of pinching people who weren't wearing green during that day. The parade in St. Louis for this year was conducted on a Saturday, just a few days before the actual commemoration. Another Irish symbol, the leprechaun, joined in the parade too. My trip to the city was just winding down (two weeks were added to my 2-week trip to California and Mexico so I could swing by St. Louis), and there was nothing planned really for that Saturday except to see the parade. The parade was held in downtown St. Louis, starting from the intersection of 18th and Market Streets, and ended in Broadway and Market. I took the metro going there from my hotel, and the trains were already full of revelers decked in green when I took one. I alighted in the Union Station and proceeded immediately to Market Street, where a throng of people already positioned themselves along the wide street. 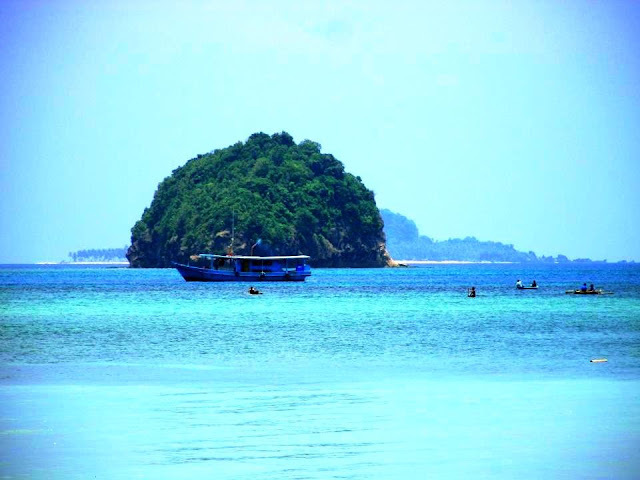 It began shortly around noon, and the atmosphere of the place began to kick up a notch. Lots of people were holding bottles of beer and drinking them freely in the streets, probably adding more buzz to the celebration that's happening along the road. Elaborate floats, marching bands, and whimsically dressed people began to stream along the parade route, greeted by the cheers of onlookers who shriek and cajole for beads to be thrown to them (just like in Mardi Gras). I saw a lot of colorful characters and groups that joined the parade. 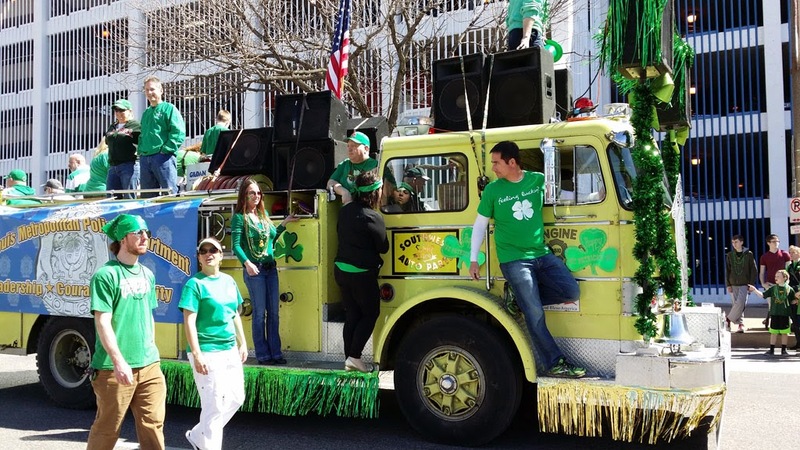 I think I saw a group of Renaissance fair actors, some people driving souped up hot rods , firemen in their firetrucks (also colored green), and floats and marching bands sponsored by Irish clans living in the city. 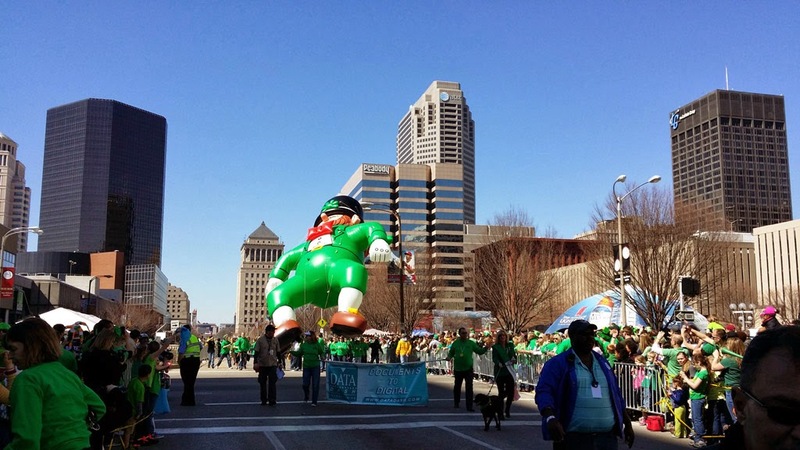 There were some huge balloons too, one of which was the shape of a of bearded leprechaun, floating in the blue sky. I also saw a pooch with green fur. 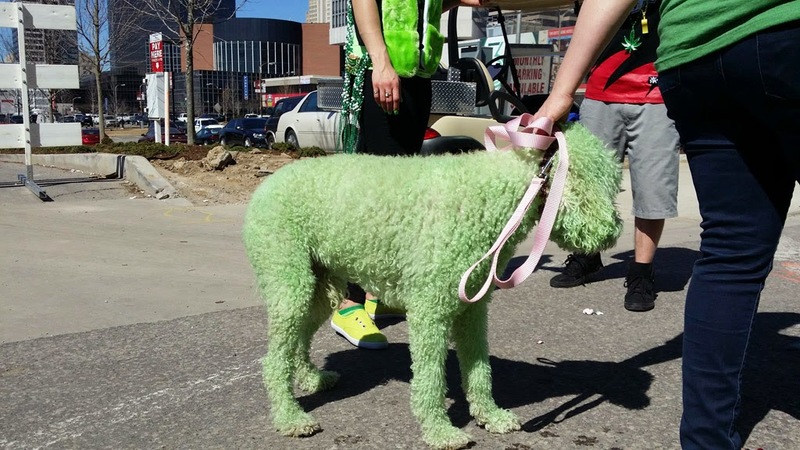 The owner told me that she dyed the dog's fur green especially just for the parade. 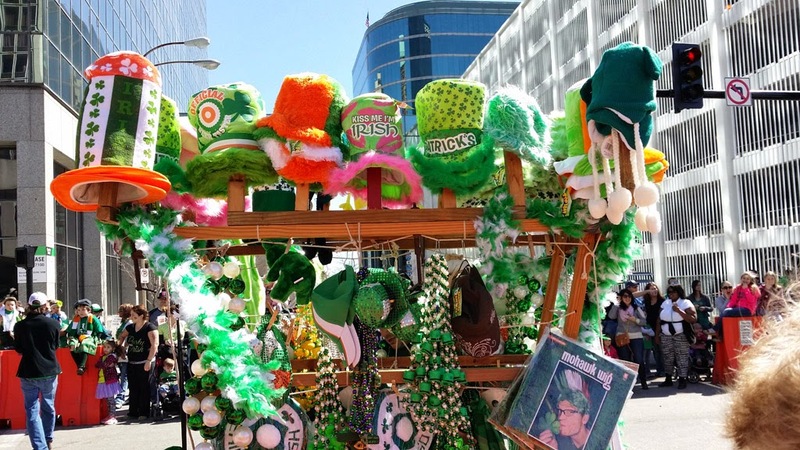 St. Patrick's Day souvenirs being sold in the street. 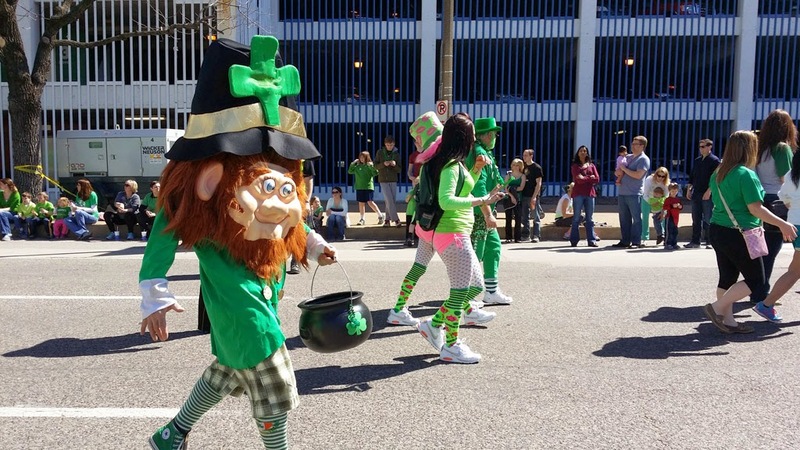 I did not wait for the parade to end, and I left as soon as I saw the floating leprechaun go past me. It was a fun experience for me though, and it was the third Christian celebration that I experienced in the United States, after the Mardi Gras in Soulard, and Ash Wednesday mass which I attended in the Cathedral Basilica. 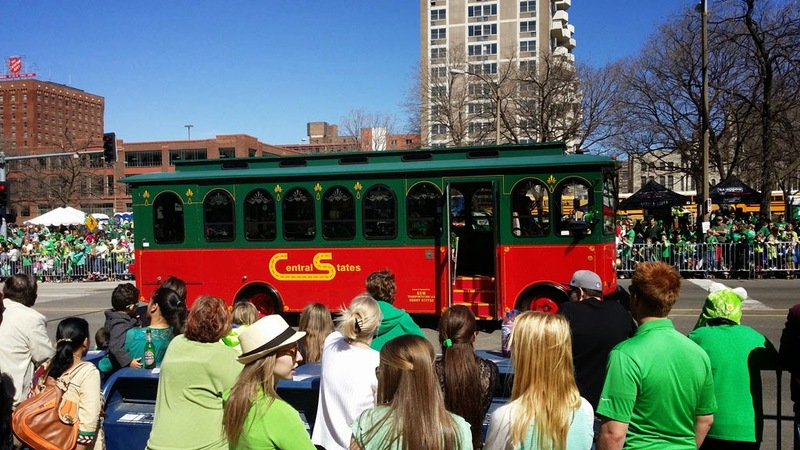 The next St. Patrick's Day parade in St. Louis will be celebrated on March 14, 2015.